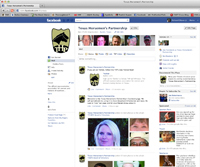 (Austin, Texas - Thursday, January 26, 2012) - On January 25, the Texas Horsemen's Partnership launched its first foray into social media with the debut of the organization's Facebook and Twitter pages. The Facebook page and Twitter feed will provide timely alerts of news and information impacting the businesses of Texas horsemen. Be sure to follow the THP on Facebook and/or Twitter to stay abreast of this important information. The THP's Facebook page can be found at www.facebook.com/thpnews. To subscribe to the THP's news feed, sign into your Facebook account and either type "Texas Horsemen's Partnership" in the search bar and click on the page with the THP logo or go directly to our URL above. Once on the THP's page, click the "Like" button at top of the page next to our name. The THP's Twitter feed can be found at www.twitter.com/thpnews. To follow the THP Twitter feed, either navigate directly to the URL above or sign into your Twitter account, type "thpnews" into the search bar, and then click on the the THP logo next to one of the Tweets and a smaller window will come up. Click the "Follow" button in that window. Be sure to let your friends and any fellow horsemen that might be interested know about the THP's Facebook and Twitter pages.